Cognitive Screening Instruments: A Practical Approach provides a practical and structured overview of some of the most commonly used and easily available cognitive screening instruments applicable in the outpatient clinic and bedside setting. Dementia and cognitive disorders are now recognised as an increasing public health problem, both in terms of patient numbers and cost, as populations age throughout the world. Despite this, many patients with dementia never receive a formal diagnosis, with implications for their appropriate care and management. Diagnostic tests which identify cases of dementia therefore have an important role. 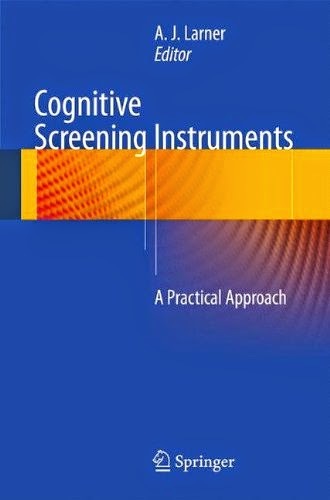 Expert authors from around the world equip the reader of Cognitive Screening Instruments: A Practical Approach with clear instructions on the usage of each screening instrument, its strengths and weaknesses, the time required for administration, and rules on scoring, such as how to correct for variations in the patient’s age or education, and suggested cut-off scores. Cognitive Screening Instruments: A Practical Approach is a handy, illustrated guide and a valuable diagnostic aid for practitioners working closely with patients with dementia and mild cognitive impairment. This volume will be of use both to clinicians and to professionals in disciplines allied to medicine who are called upon to assess patients with possible cognitive disorders, including neurologists, old age psychiatrists, neuropsychologists, primary care physicians, dementia support workers, and members of memory assessment teams.